The service of India’s longest ropeway is scheduled to be started in Guwahati by April this year, says reports. The total length of the ropeway is 1820 metres and each cable car travelling through the ropeway will have a capacity of carrying 30 passengers. The total duration of travelling from the lower to upper terminal will be eight minutes. The much-waited ropeway over the Brahmaputra river will help in reducing travel time of passengers to a great extent. The lower terminal of the ropeway will be at Kachari Ghat in Panbazar and the Rajadwar village behind the Dol Govinda Temple in North Guwahati would serve as the upper terminal. Renowned ropeway designer Garaventa AG of Switzerland has provided technical support for profile design of the ropeway. Apart from reducing the travelling time, the ropeway will give people a stunning aerial view of the beauty of the Brahmaputra river. This ropeway project in the city is expected to cut down travel time of one hour to seven minutes. This mode of transportation will also give the passengers an aerial view of Brahmaputra, Umananda Temple on the Peacock Island, and the Urvashi island. According to information, passengers’ cabin for the project have been imported from Switzerland and tower materials have been brought from Kolkata and Delhi. 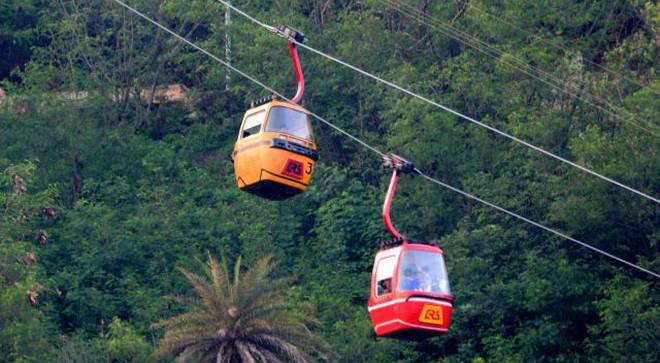 It may be mentioned Assam Finance Minister Himanta Biswa Sarma last year announced on the floor of the State Assembly about another ambitious project of a ropeway connecting Guwahati to Kamakhya Hills. Announcing the project, Sarma had said, “Kamakhya is a top tourist destination of the state. We have decided to build this ropeway to attract more tourists to Assam as well as Kamakhya. We have earmarked a sum of Rs 33 crores for this project.